I created this very simple worksheet from season 7, episode 17 of Friends (The one with the cheap wedding dress). The episode doesn´t have foul language, and it´s a very funny one. The students have to answer a few questions and write five new words (they have to look up and copy their definitions later). There are two exercises on this worksheet. In the first one, there are pictures with different problems, and students need to give advice for each situation. In the second one, students need to choose between two different modals. This is a test that I made for my class. You could use it as a test or as separate exercises. 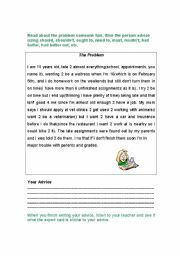 There is a blank filling activity (measure words), an activity where students need to correct mistakes (quantifiers) , and a multiple choice activity (quantifiers). 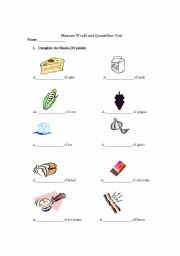 There is a multiple choice activity, and then a chart that students need to complete with quantifiers. 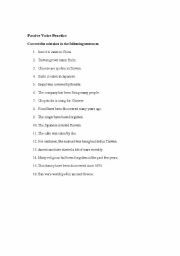 This activity was designed from mistakes that students in my class made when trying to make sentences using the passive voice. 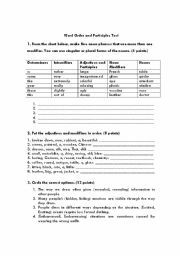 The worksheet is designed so that students identify subject, verb, and object, and then they need to write a new sentence in the passive voice. 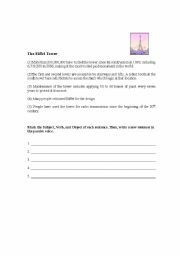 This test combines two different topics, but you could use it as separate activities. 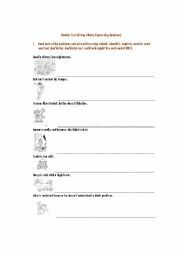 Students need to circle the right option (-ing/-ed), complete blanks (well-cooked, time-consuming), combine words to form noun phrases, and put adjectives in order.